HFB570S is a semi hydraulic paver block machine, it has a small manual control box, with hydraulic power in molding system. So it is easy to operate and cycle time is within 20 seconds. It is very suitable for small factory or family to do business which only needs very little budget. 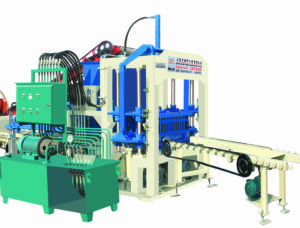 HFB570S hollow block maker manual adopts mechanical transmission way to work, also its compactable structure and reasonable arrangement achieve the stable performance and low malfunction rate, which makes operation and maintainence more easier. Firstly, synchronous vibration insures the amplitude of the vibration table. Also the frequency can change according to different technich. Low frequency in feeding material, high frequency vibration makes the different material to get an optimal vibration way, so it ensures the high quality of concrete products. HFB570S adopts semi PLC control system, thus it is easy to operate, and it can reduce failure rate vastly. Hence the machine can run with high stability and reliability. In addition, combine with long-distance controlling system, it can achieve scrutiny, controlling, diagnosis. Therefore fault diagnosis system gets high appreciation in our customers. Finally, man-machine interface, control system equipped with complete logic control, production program, malfunction diagnosis system and remote control function. So it doesn’t need a professional person but only need a simple trained one to the operator. If you are interested in these products, please leave your message, our relevant staff will contact you quickly.